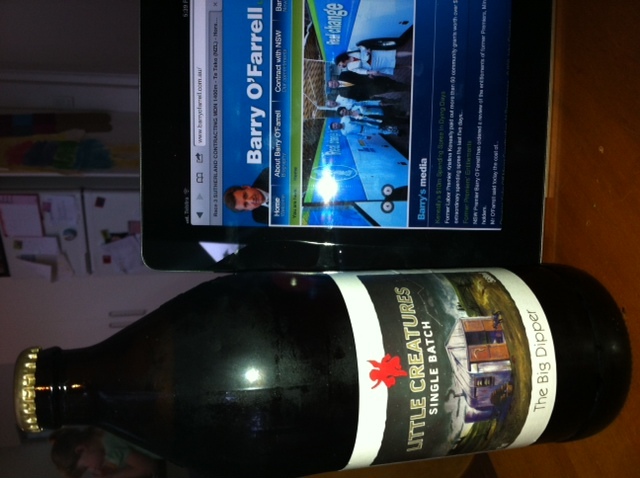 Little Creatures do the odd single batch release and this one is a monster. A hopmonster. But first my curmudgeonly rant. This correspondent is a long suffering northern beaches (Sydney) commuter. The bus services from these here parts to the city are third world. At least we have the beaches ’cause the commute is suicide-inducing. The buses are infrequent and, while there is a timetable, its treated as more a random number generator. The local member up here, @mikebairdmp, recently announced a ‘pre feasibility’ study into improving bus services. Pre-feasibility, I love it, woooah there Mike, best not move too fast. The normal experience for the northern beaches bus commuter (and most of the north shore at that) is to end up queueing across the deck of the Sydney Harbour Bridge as York St turns into bus gridlock. Luckily, this forms part of the view from the office of our state premier, @barryofarrell. I always use all the spare time I have while sitting in this bus graveyard to send Barry a few choice tweets about his management of Sydney’s transport system. Though he’ll probably blame the previous Labor government (or at least the pimply, self important young Liberal member who looks after his tweeting will). Anyway, on to the monster. Little Creatures claim on the label “…for our next Single Batch release we couldn’t wait to make a massive hop fueled double IPA….it’s about the biggest charge of hops ever seen in the Creatures brewhouse”. And, boy oh boy, they are right. It’s very hoppy, both in smell and overwhelmingly in the first taste. It’s a little bitter in the follow up and this turns sweeter as tasting went on. But it’s the hops that impress. I was burping hops hours later. It pours a beautiful deep amber and has a mule kick of an ABV at 7.8%. As the guy on the till at Porters, Balgowlah said as I paid, “well spotted”. Indeed. I have a bottle lurking in the fridge. A souvenir from Melbourne. Looking very forward to it. The E70 isn’t bad, but I guess the Sydney Road main drag is an easy route to service. That’s why we get the ferry home!